Erie – With French contact limited to one brief meeting, very little is known for certain about the Erie except they were important, and they were there. The Dutch and Swedes also heard about them through their trade with the Susquehannock, but never actually met the Erie. All information about their social and political organization has come from early Jesuit accounts of what they had been told by the Huron. Eyak – The Eyak, literally “inhabitants of Eyak Village” are a Native American indigenous group traditionally located on the Copper River Delta and near the town of Cordova, Alaska. The Eyak’s territory reached from present-day Cordova east to the Martin River and north to Miles Glacier. The Eyak initially moved out of the interior down the Copper River to the coast. There they harvested the rich salmon fishing grounds. When the Russians arrived they recognized the Eyak as a distinct culture and described their territory on their maps. They also traded with the Eyak and sent them missionaries. Because of their small population, they were often raided and their territory boundaries were under pressure from the Chugach to the west. The Tlingit, on the east side, had better relations with the Eyak and this led to intermarriage and assimilation of many Eyak. This pushed the Eyak’s territorial boundary further west and contributed to the Eyak’s decline. When the Americans arrived they started canneries and competed with the Eyak for salmon. This combined with integration with, and diseases introduced by non-native settlers led to the further decline. As populations decreased the remaining Eyak began to congregate near the village of Orca. In 1880 the population of the village of Alaganik was recorded at 117 and by 1890 it had declined to 48. In 1900 the total population was estimated at 60. As more settlers arrived this last village became the town of Cordova. As of 1996, there were 120 living, partial Eyak descendants. The last full-blooded Eyak died in 2007. 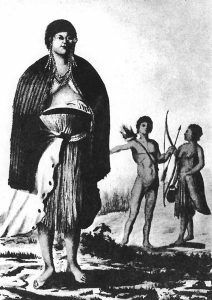 Eno – A tribe associated with the Adshusheer and Shakori in North Carolina in the 17th century, historians believe it doubtful that the Eno and the Shakori were of Siouan stock, as they seem to have differed in physique and habits from their neighbors. However, their alliances were all with Siouan tribes. Little is known of them as they disappeared from history as tribal bodies about 1720, having been incorporated with the Catawba on the south or with the Saponi and their confederates on the north, although they still retained their distinct dialect in 1743. The Eno and Shakori were first mentioned in 1654, when the Tuscarora tribe described them as living next to the Shakori, “a great nation ” by whom the northern advance of the Spaniards was valiantly resisted. The next mention of these two tribes was in 1672 stating they lived south of the Occaneechi about the headwaters of Tar and Neuse rivers. The general locality is still indicated in the names of Eno River and Shocco Creek. In 1701, the Eno and Shakori confederated and the Adshusheer united with them in the same locality. Their village, called Adshusheer, was on Eno River, about 14 miles east of the Occaneechi village, which was near the site of present-day Hillsboro. Esselen – The Esselen were a tribe of California Indians who are indigenous to the Santa Lucia Mountains of the region now known as Big Sur in Monterey County, California. Eyeish – The Eyeish were a tribe of the Caddo Confederacy but spoke a different dialect, now extinct, that was very different from the dialects of the other Caddo tribes; hence, it is probable they were part of an older confederacy which was incorporated in the Caddo when the latter became dominant. Five Civilized Tribes – A group of southeastern tribes noted by whites for their advanced culture. All were Muskogean speaking peoples except for the Cherokee. The five tribes included the Cherokee, Chickasaw, Choctaw, Creek, and Seminole. Fox – An Algonquian tribe, they were so named, because once while some Wagohugi, members of the Fox clan, were hunting, they met the French, who asked who they were. The Indians gave the name of their clan, and ever since the whole tribe has been known by the name of the Fox. Their own name for themselves is Měshkwa`kihŭg, which means red-earth people” because of the kind of earth from which they are supposed to have been created. They were known to the Chippewa and other Algonquian tribes as Utŭgamig, or “people of the other shore”. For the Iroquois entry, you forgot the Cayuga tribe.